Conan Doyle Sees Victory for England; One Successful Pounce Will Win is an article written by Arthur Conan Doyle published in The New-York Times on 24 october 1915. Declares Mistakes Few and Triumphs Many, Scouts Fantastic Fears, and Pictures the Germans as Walking Into a Trap in Their March Into Turkey. LONDON, Oct. 23. — The Duke of Wellington, in one of those acute philosophic asides which cropped up occasionally in his businesslike correspondence, remarked that a deep vein of madness ran through the British character. The noun is perhaps rather harsh, but our best friends have found marked eccentricity in our mental processes. One of the most curious manifestations is a tendency to excessive and ill-timed self-depreciation, not universal, for we have our optimists and even our braggarts, but so clamorous at times as to engage the attention of the whole world and completely deceive them as to our real situation and character. The historian will find the phenomenon at all ages of our chronicle, and I expect that the original blue-skinned savage, as he poled his corracle along our creeks, was already lamenting the degeneration of his stock. It has, however, grown upon us with the years, and surely the most absurd sight of all the ages is that of Great Britain during our generation moaning and sobbing over her own inefficiency, while rapidly gathering up as much of the earth's surface and of the world's wealth as she could possibly lay her hands upon. No better illustration of this national tendency could be found than a contrast between the German and British press during the last few months. If one were to take them at their face value, one would imagine, to read these articles, that Germany was not only confident of the future, but had in the past reason to congratulate herself upon the results of her efforts against Great Britain, while, on the British side, one would gather that there was great despondency and that up to now we had no reason to be satisfied with anything which we had done in the war. Yet in our heart of hearts we are as certain of victory as that tomorrow's sun will come, and a dispassionate survey will satisfy any student of history that no great war in which our country has ever been engaged has been marked in the same space of time by such triumphant successes as those of the last fourteen months. Our troubles have been those of our allies; our victories have largely been our own. Germany can make a good showing up to date against the coalition. Against Great Britain she has been beaten at every turn. Consider what we have done in this short space of time and compare it with the opening of any of our greater wars. In our war against the French Republic it was nearly two years after its inception that Howe's victory gave us a gleam of success. In the great war against Napoleon it was again two years before Trafalgar ended the fear of imminent invasion and twelve years of very varying fortunes before we won through. Now, look at the work of fourteen months. We have annexed the whole great German colonial empire, with the exception of East Africa and a district in Kameruns; we have swept the German flag, both imperial and mercantile, off the face of the ocean; we have completely sterilized her fleet; we have repelled her serious submarine attack; played our game so skillfully that the flux of time shows us stronger, not weaker, in comparison; we have conquered South Mesopotamia from the Turks; we have completely repelled their attempted invasion of Egypt; we have helped to save Paris; we have, with French and Belgian assistance, but mainly by our own exertions, stopped the advance upon Calais, inflicting a loss of several hundreds of thousands upon the Germans; we have, by our intervention at Antwerp, helped to extricate the Belgian Army; finally, and greatest of all, we have raised an enormous voluntary army, which is large enough to turn the scale between the European forces, and we have converted ourselves, with wonderful adaptability, into the great factory and munition store of the Allies. That is our story, and if any man cannot see that it is a wonderful one, he is not merely a pessimist, but blind. What have we to put on the other side of the account? I am dealing for the moment with large results, and not with details. Where have we failed? In the whole world our most severe critic could only point to one place — the Dardanelles. But have we failed in the Dardanelles? I believe that if we should never force the strait the enterprise has none the less been worth the undertaking. We have lost 100,000. How many have the Turks lost? Certainly not less. We have held up a great body of their best troops, who would otherwise have been operating against us on the Egyptian and Mesopotamian fronts or in the Caucasus against the Russians. General Ian Hamilton has taken the pressure off General Maxwell on the one side and General Nixon on the other. But the greatest of all the results from the Dardanelles expedition is that it has united us with Russia as nothing else could have done. She cannot now say, as she might have said, that we thought only of our own empire. We have spent our blood and our ships in trying to force the gates which close her in. When the episode remains a historical reminiscence, like the passage of Admiral Duckworth in 1807, this great result will still remain. Again, one sequel which may prove to be of vital importance may spring from the Dardanelles. It is our operation there and the consequent danger to their ally which has drawn the central powers on to their southern advance. The immediate result of this has been to bring into the war the Serbians, who for nearly a year had been practically neutral, and so to open up a new front, which has to be supplied by the Germans with men and munitions. It is tapping a fresh vein in a body which is already slowly bleeding to death. What have they to gain there? Putting aside all megalomaniac visions of an advance upon India, what is their practical goal? Should they over-whelm Serbia, it will go to our hearts, but will make no difference in the war, since Serbia had, as I already remarked, been obliged to rest upon her oars for many months. What next could they advance upon? Constantinople, with a strong allied force in-trenched upon their flank at Saloniki? Would the Turks really welcome an army of Bulgars and other hereditary enemies marching into their capital at the expense of their hereditary friends? And if we assumed everything and suppose them at Constantinople, what then? How will they cross the Egyptian desert and meet the quarter of a million whom we could line up on the Suez Canal? What will it profit them to be strong in Asia Minor by the time that attrition has worn them down east and west and the ever-thickening allied lines are pushing inward for Berlin? The more steadily one gazes at these fantastic fears the more they shred into mere phantoms of the imagination. The gains of the German expedition are shadowy and distant, the losses are immediate and obvious, and it is the Dardanelles pressure which has drawn them forth. But have we failed at the Dardanelles? It is surely too early to say. Mr. Winston Churchill has been criticised for saying that only a few miles separated us from victory. Never was criticism more carping and unintelligent. What he said was an obvious fact, as true today as then. Had he said a few weeks, or even months, criticism would be intelligible, but he said miles, which was obviously true. What he meant to convey, and what he did clearly convey, was that if we had the victory we could not be robbed of the fruits of it as the Germans were robbed of their Paris, but that the Prize was in our hands the instant the success was attained. He did not underrate the formidable task. Still less would any one do so now. But we do not know the difficulties of the enemy. We cannot tell what weakening may occur or what change may come. We are ready on land and sea, and it is as true as ever that it is only a question of one successful pounce. It is surely too early to write off the Dardanelles loss and to put it down as the one single item which should appear upon the debit side of our account, but I repeat that if there is no forcing of the strait, none the less the historian of the future may very well find that the operations have had far-reaching and fateful results. The campaign began by defeats, honorable and inevitable, but none the less defeats, at Mons Aug. 23, and Le Cateau Aug. 26. This was followed by the victory of the Marne, Sept. 6-11, in which the honors rest with our French allies, and the drawn battle of the Aisne on Sept. 13, in which for the first time immoble lines were formed, a confession of failure upon the part of the invaders. There followed the long-drawn, scrambling action of La Bassée, Oct. 12-31, in which no result was obtained and immobility was again enforced. Simultaneously was fought the first battle of Ypres, Oct. 20-Nov. 13, in which the Germans were repelled, with very heavy losses, in their repeated attempts to capture that city. This brought the fighting of 1914 to an end, save for the sharp fight at Festubert, Dec. 19-21, where the British sustained a reverse on the first day, which was equalized, by a successful counterattack on the second. The campaign of 1915 began with the costly British victory at Neuve Chapelle on March 10, involving the permanent capture of the village. There followed the local but intense fighting of Hill 60, which ended in a complete British victory at the time, though the garrison was afterward driven out by poison on May 5. Then came the second battle of Ypres, from April 22 to May 24, one of the great battles of all time, in which the Germans failed again in their main objective, to capture the town and break the line, but did succeed in taking four heavy guns and some prisoners from us, besides gaining about two miles of ground along a front of twenty miles. It may therefore be fairly described as a German success. Before this fight had ended a second battle had broken out further down the line — the battle of Richebourg, May 9-24, which began by a bloody repulse of the British attack, but ended by a considerable and permanent gain of ground. Then followed the fighting around Hooge, which continued with about equal fortunes during the whole Summer, the Germans having marked success on July 30-31, while the British won distinct victories on June 15-16 and Aug. 9. Finally came the battle of Loos on Sept 25, which can even now be hardly said to have finished, but which certainly has been a British victory, involving a gain of ground, prisoners, and guns. Such, in bare epitome, is our military record up to date. It is to be remembered that for the first six months the Germans had a very marked preponderance of numbers, and that in the second half year, when the numbers had been equalized, they had an even more marked preponderance of guns and munitions. By the splendid exertions of the Allies the numbers in the west are now in our favor and the munitions at least on an equality. What, then, may we not expect from the future? Not only have we nothing to reproach ourselves with and a very great deal upon which to congratulate ourselves in actual war, but we have, as it seems to me, made remarkably few mistakes. Beforehand, thanks to the firmness of Mr. McKenna (First Lord of the Admiralty, 1908-1911) in the matter of the eight great ships, and the driving power of Mr. Churchill (First Lord from 1911 to 1915) in the years immediately before the war, our navy was ready as it had never been before for a supreme struggle. Of the four army corps, which were the most that we had ever thought of sending abroad, two and a half were in time for the first clash, and the others followed. We played our part as we said we would play it, and we won our game, so far as we can count gains and losses, between Germany and ourselves. If Mr. McKenna and Mr. Churchill put us in a strong position upon the water Lord Haldane (ex-War Secretary) forged the weapon which was to do such great service upon the land, the British military machine as we and the Germans know it. The splendid Territorial Army, the officers' training corps, which has been of such vital service, the conversion of the expeditionary force into a practical reality - all sprang from his clear and far-seeing mind. When one remembers his long defense of the territorials, the gibes to which he and they were subjected, the ridicule with which his assertion was met that they would have time after the outbreak of the war to become good troops before taking the field, and when one sees how entirely his forecast has been borne out, one does not know which is the more surprising — his foresight or the ingratitude and perverseness of so many of his fellow-countrymen. Future generations will, I think, look upon Lord Haldane as one of the saviors of the country. After the outbreak of the war we have also been extraordinarily fortunate in our leaders. If one searched backward through the glorious files of British history one could not pick on a man who was so fitted by nature and training for the supervision of such a war as Lord Kitchener. His cold, mathematical brain, his power of thinking in terms of the year after next, his enduring, inflexible will power, his freedom from politics — all of these qualities make him an ideal leader in such a war. And what a collaborator in Mr. Lloyd George, who supplies exactly what a soldier lacks — the touch with the democracy, the power of the burning word, acquaintance with practical conditions of British life! With such men at home, and with our leaders on sea and land, from Admiral Jellicoe and Field Marshal French downward, we can surely face the future with a light heart. Our troubles have never really been our own, but have arisen from the fact that the secret preparations of the central powers have made them for a limited time more powerful upon land than their neighbors. The margin of strength which is wanted we have to supply. By a miracle of organization and national spirit we shall be able to do so. The worst of this unreasonable, pessimistic criticism is that it takes the heart out of men who are conscious of their own good work and makes them feel as if good and bad were alike. Also, it depresses the public and makes them vaguely think that all is wrong when nearly all is right. The conduct and handling of the navy have fortunately been largely immune from carpers, but take as an example the continual reiteration of such phrase as "The muddling of the War Office." The extraordinary efficiency of our War Office has been one of the surprises of the war. Was it muddling when it sent an expeditionary force abroad with such celerity and completeness, with a commissariat which all agreed to be unequaled and with transport and medical service which are the envy of our allies? We talk with appreciation of the tenfold expansion of our army, but Lord Kitchener does not do such things by a wave of a wand. They are carried out by the hard work and organizing power of the War Office, which has expanded itself to tenfold duties within a year. As to the munition question, it is one which came as a surprise to us, as to all the world, but it is notorious that there were economical, and not administrative, reasons for the delay in high explosives. Free trade has no doubt many advantages, but it has its corresponding defects, and if you depend upon production in your own land you are likely to have such a crisis as we have successfully surmounted. We take our history morning by morning, and often the morning seems a dark one. It is not thus that it is written hereafter. We see every swirl and backwater, but the man of the future will see only the main current of the stream. There is no cause there for pessimism, but rather good reason why we should be on our knees, thanking the Power that guides our destiny for evident proof that Great Britain still has the old clear brain to plan and the old strong arm to strike. Le duc de Wellington, dans l'un de ces profonds apartés philosophiques que l'on rencontre parfois dans sa correspondance si froide, comme celle d'un homme d'affaires, remarque qu'une veine profonde de folie court dans le tempérament anglais. Le mot est peut-être un peu fort, mais nos meilleurs amis ont trouvé une excentricité très marquée dans certaines de nos façons de penser. L'une des manifestations les plus curieuses de cette bizarrerie est notre tendance à nous déprécier outre mesure et hors de propos ; elle n'est pas universelle, car nous avons nos optimistes et même nos vantards, mais elle est si bruyante à certains moments qu'elle attire l'attention de tout l'univers et qu'elle l'égare complètement sur notre vraie situation et sur notre caractère. L'historien trouvera que ce phénomène a eu lieu à toutes les époques de notre histoire, et je suppose que l'aborigène qui se teignait le corps en bleu et poussait son bateau primitif le long de nos criques se lamentait déjà sur la dégénérescence de sa race. Ce défaut a toutefois grandi chez nous avec les années et, à coup sûr, l'on ne saurait concevoir de spectacle plus absurde que celui de la Grande-Bretagne, gémissant et pleurant à notre époque sur son manque d'organisation. On ne saurait trouver de meilleur exemple de cette tendance nationale que dans le contraste qui existe entre la presse allemande et la presse anglaise depuis quelques mois. Si l'on devait les prendre au pied de la lettre, l'on s'imaginerait, à la lecture de ces articles, que l'Allemagne n'a pas seulement confiance en l'avenir, mais qu'elle a lieu de se féliciter de ses efforts passés contre la Grande-Bretagne, tandis que, de l'autre côté, l'Angleterre serait plongée dans le désespoir, et jusqu'à présent n'aurait pas lieu d'être satisfaite de la moindre des choses qu'elle a accomplies pendant la guerre. Et cependant, au fond de nos coeurs, nous sommes aussi certains de la victoire que nous le sommes de voir le soleil apparaître demain ; et une étude impartiale de nos annales convaincra n'importe quel étudiant de notre histoire que jamais guerre, entreprise par nous, n'a été marquée, dans le même laps de temps, par d'aussi éclatants succès que ceux que nous avons remportés depuis quatorze mois. Nos inquiétudes ont été celles de nos Alliés. Nos victoires ont été vraiment en grande partie les nôtres. CE QUE NOUS AVONS ACCOMPLI. Considérons ce que nous avons fait dans ce court espace de temps, et comparons-le avec les premiers mois de l'une de nos guerres. Dans notre lutte contre la République française, près de deux années s'écoulèrent après la déclaration de guerre, avant que la victoire de Howe vînt nous donner le moindre espoir de succès. Dans la grande guerre contre Napoléon, il fallut aussi deux années avant que Trafalgar vînt mettre fin à la crainte d'une invasion imminente, et douze années de fortunes diverses s'écoulèrent avant notre triomphe absolu. Et maintenant regardons notre oeuvre pendant ces quatorze mois. Nous avons annexé tout l'empire colonial de l'Allemagne, à l'exception de l'Afrique orientale allemande et d'une partie de sa colonie du Caméroun. Grâce aux nobles efforts de notre flotte, nous avons chassé de la surface des mers le pavillon allemand, le pavillon de sa marine de guerre et celui de sa marine marchande. Nous avons réduit sa flotte à une inactivité absolue. Nous avons repoussé les sérieuses attaques de ses sous-marins, et nous avons joué nos cartes si habilement que le temps, en s'enfuyant, nous laisse plus forts, et non pas plus faibles, en comparaison des Allemands. Nous avons conquis sur les Turcs le sud de la Mésopotamie. Nous avons complètement repoussé leur tentative d'envahir l'Egypte. Nous avons contribué à sauver Paris. Nous avons, avec l'aide des Français et des Belges, mais surtout grâce à nos propres efforts, arrêté la marche en avant des Allemands sur Calais, et nous leur avons infligé des pertes se montant à plusieurs centaines de milliers d'hommes. En venant au secours d'Anvers, nous avons permis à l'armée belge de se retirer en bon ordre. Enfin, — et cela a été le plus grand de nos efforts, — nous avons levé une énorme armée volontaire, qui est assez grande pour faire pencher la balance en notre faveur, et nous avons fait de l'Angleterre, faisant preuve en cela d'une grande puissance d'adaptation, une immense fabrique de munitions pour les Alliés. Telle est notre histoire, et celui qui ne peut voir que c'est là une histoire merveilleuse, est non seulement un pessimiste, mais un aveugle. Qu'avons-nous maintenant à porter du côté de notre passif ? Je ne m'occupe en ce moment que des résultats dans leurs grandes lignes, et non des détails. Où avons-nous échoué ? En regardant sur la carte de l'univers, le critique le plus rigoureux ne pourrait indiquer qu'un seul endroit, les Dardanelles. A mon avis, en supposant que nous n'arrivions jamais à forcer les Dardanelles, cette campagne valait la peine d'être entreprise. Nous avons perdu cent mille hommes. Combien d'hommes les Turcs ont-ils perdus ? Certainement autant que nous. Nous avons retenu près de nos lignes un corps considérable des meilleures troupes ottomanes, qui, autrement, auraient lutté contre nous en Mésopotamie et sur la frontière égyptienne, ou au Caucase contre les Russes. Tan Hamilton a attiré sur lui la pression que les Turcs auraient exercée sur Maxwell d'un côté et sur Nixon de l'autre. Mais le plus grand de tous les résultats de cette expédition des Dardanelles a été le suivant : cette entreprise nous a unis à la Russie, comme aucune autre chose n'aurait pu le faire. La Russie ne peut plus dire maintenant, comme elle aurait pu le faire, que nous n'avons pensé qu'à notre Empire. Nous avons versé notre sang et perdu nos navires en essayant de forcer les portes qui enfermaient cette grande Puissance. Lorsque cet épisode de la guerre ne sera plus qu'un souvenir historique, comme le passage de Duckworth, en 1807, ce grand résultat restera toujours. IMPORTANCE DE L'EXPÉDITION DES DARDANELLES. De plus, un résultat qui peut avoir la plus grande importance peut sortir de cette expédition des Dardanelles. C'est cette expédition, et le danger qui en résulta pour la Turquie, leur alliée, qui a forcé les Puissances centrales à entreprendre la campagne des Balkans. La conséquence immédiate de ce mouvement a été de les amener à attaquer les Serbes qui, depuis près d'une année, étaient restés neutres, pour ainsi dire, et de créer un nouveau front sur lequel les Allemands doivent envoyer des hommes et des munitions. C'est là ouvrir une nouvelle veine dans un corps qui perd lentement tout son sang. Quel gain l'Allemagne et l'Autriche espèrent-elles obtenir là-bas ? Mettons de côté leur mégalomanie et leur espoir d'envahir l'Inde, quel but pratique se proposent-elles ? Admettons qu'elles écrasent la Serbie, la défaite des Serbes sera un vrai deuil pour nous, mais ne changera en rien la guerre, puisque la Serbie, comme on en a déjà fait la remarque, s'est reposée sur ses premiers lauriers pendant de nombreux mois. Que peut-il arriver ensuite ? Les Allemands peuvent-ils marcher sur Constantinople, tandis que d'importantes forces franco-anglaises, retranchées à Salonique, menacent leur flanc ? Les Turcs accueilleront-ils joyeusement une armée de Bulgares, de leurs ennemis héréditaires, à leur entrée dans leur capitale, après la défaite de leurs amis héréditaires ? Mais admettons le triomphe des Allemands, et supposons-les à Constantinople, que peuvent-ils faire ensuite ? Comment traverseront-ils le désert du Sinaï pour rencontrer les deux cent cinquante mille hommes, que nous pouvons aligner sur le canal de Suez? Quel profit retireront-ils d'être puissants en Asie Mineure si, à ce moment, notre guerre d'usure les a épuisés à l'est et à l'ouest, et que les lignes de plus en plus fortes des Alliés les repoussent dans la direction de Berlin ? Plus on regarde fixement ces craintes fantastiques, plus on les voit se dissiper en purs fantômes de l'imagination. Les profits de cette entreprise de l'Allemagne sont bien hasardeux et lointains. Les pertes qu'elle subira sont immédiates et évidentes. Et c'est la pression que nous avons exercée aux Dardanelles qui a attiré les Allemands de ce côté. Mais avons-nous échoué aux Dardanelles ? A coup sûr, il est trop tôt pour parler ainsi. L'on a reproché à Winston Churchill d'avoir dit que quelques kilomètres seulement nous séparaient de la victoire. Jamais critique dirigée contre un homme d'Etat n'a été plus malveillante ni plus stupide. Ce que Winston Churchill a dit était une vérité évidente, aussi vraie aujourd'hui qu'elle l'était alors. S'il avait dit que quelques semaines ou même quelques mois seulement nous séparaient de la victoire, l'on comprendrait que de telles paroles fussent critiquables. Mais il a dit que des kilomètres nous séparaient de la victoire, ce qui est évidemment vrai. Ce qu'il voulait dire, — et ce qu'il dit d'une façon très claire, — c'était que si nous remportions la victoire, nous ne pouvions perdre les fruits de cette victoire, de la même façon que les Allemands avaient perdu leur Paris, et que le fruit de notre triomphe était dans nos mains, du jour où nous aurions été vainqueurs. Il n'a pas déprécié la tâche formidable que nous avions entreprise. Et personne ne voudrait encore moins le faire maintenant. Mais nous ignorons les difficultés de l'ennemi. Nous ne pouvons dire quel défaut dans son armure peut se révéler, ou quel changement peut survenir. Nous sommes prêts, sur terre et sur mer, et il est aussi vrai aujourd'hui qu'hier de dire que le triomphe ne dépend que d'un bond victorieux de nos soldats. A coup sûr, il est trop tôt pour passer au compte des profits et pertes l'expédition des Dardanelles, et pour déclarer qu'elle est le fait qu'il faille porter à notre passif. Mais, je le répète, à supposer que nous n'arrivions pas à forcer ce passage, l'historien de l'avenir peut parfaitement déclarer qu'une telle entreprise a eu des conséquences d'une portée incalculable. Si nous envisageons notre campagne en France et dans les Flandres, nous voyons que de grands événements ont eu lieu si prés de nous et ont jeté une telle confusion dans nos idées par leur répercussion successive, que nous devons d'abord en détacher notre esprit, afin de les voir dans leur vraie proportion et dans leur rapport les uns avec les autres, ainsi qu'avec l'histoire éternelle. En ce qui concerne la campagne anglaise, le résumé suivant est exact dans ses grandes lignes. La campagne commença par des défaites (honorables et inévitables, mais défaites cependant) à Mons (23 août) et au Cateau (26 août). Puis vint la victoire de la Marne (6-11 septembre) dont l'honneur revient aux Français, nos alliés, puis vint la bataille indécise de l'Aisne (13 septembre), dans laquelle, pour la première fois, les armées se retranchèrent derrière des lignes immobiles, aveu d'échec de la part des envahisseurs. L'action de La Bassée suivit, longue et chaudement disputée (12-31 octobre) ; aucun résultat ne fut obtenu de part et d'autre, et de nouveau l'on fut condamné à l'immobilité. En même temps se livrait la première bataille d'Ypres (20 octobre-13 novembre) dans laquelle les Allemands furent battus et firent des pertes effroyables, en essayant à plusieurs reprises de s'emparer de cette ville. Ainsi se termina la lutte pour l'année 1914, si l'on excepte une action fort vive à Festubert, du 19 au 21 décembre, dans laquelle les Anglais subirent un échec le premier jour, mais le réparèrent en contre-attaquant victorieusement le lendemain. La lutte de 1915 commença par une victoire anglaise fort coûteuse à Neuve Chapelle, le 10 mars, mettant le village entre nos mains d'une façon permanente. Vint ensuite la lutte intense, mais localisée autour de la cote 60, qui se termina par une victoire complète pour notre côté, au moment même, mais la garnison en fut chassée plus tard par des gaz asphyxiants, le 5 mai. Nous avons plus tard la seconde bataille d'Ypres, du 22 avril au 24 mai, l'une des plus grandes batailles de l'histoire, dans laquelle les Allemands ne purent de nouveau atteindre leur but principal, qui était de s'emparer de la ville et de rompre nos lignes, mais réussirent à faire prisonniers quelques-uns de nos soldats, à prendre quatre canons de gros calibre, et à gagner sur un Iront de vingt milles environ une bande de terrain de deux milles environ ; on peut donc, avec justice, décrire cette bataille comme un succès allemand. Mais avant la fin de ce combat, une seconde bataille avait commencé plus bas sur la ligne, la bataille de Richebourg (du 9 au 24 mai), qui commença par l'échec sanglant d'une attaque anglaise, mais finit par nous faire gagner un terrain considérable, et cela d'une façon permanente. Nous avons ensuite la lutte autour de Hooge, qui se poursuivit avec une fortune à peu près égale de part et d'autre, pendant tout l'été, les Allemands ayant un succès marqué le 30 et le 31 juillet, et les Anglais remportant des victoires signalées le 1.5 et le 16 juin et le 9 août. Enfin éclata la bataille de Loos le 25 septembre, dont on ne peut dire encore qu'elle soit terminée, mais qui a été certainement une victoire anglaise, et dans laquelle nous avons gagné du terrain, fait des prisonniers et enlevé des canons à l'ennemi. Tel est le résumé très succinct de notre effort militaire jusqu'à ce jour. L'on doit se rappeler que pendant les six premiers mois de la guerre les Allemands l'emportaient par le nombre, et que, dans la seconde moitié, alors que les forces étaient égales, ils l'emportaient encore davantage par le nombre de leurs canons et de leurs munitions. Grâce aux efforts merveilleux des Alliés, nous avons maintenant à l'ouest la prépondérance numérique, et nous sommes au moins « à égalité » au point de vue des munitions. Dès lors que ne peut-on pas attendre de l'avenir ? Nous avons joué notre rôle. D'un côté, non seulement nous n'avons rien à nous reprocher, mais nous avons de nombreuses raisons de nous féliciter, et par ailleurs nous avons, à mon avis, commis très peu de fautes avant la guerre. Grâce à la fermeté de McKenna sur la question des huit grands cuirassés, et à l'énergie irrésistible de Churchill, pendant les années qui ont précédé immédiatement la guerre, notre marine était prête, comme elle ne l'avait jamais été, pour une lutte suprême. 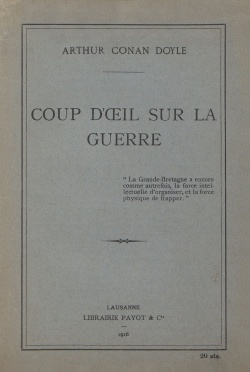 Sur les quatre corps d'armée qui, à notre avis, devaient être le contingent maximum qu'on pût envoyer à l'étranger, deux corps et demi purent être envoyés pour la première bataille, et les autres suivirent aussitôt après. Nous avons joué le rôle que nous avions promis de jouer, et nous avons gagné la partie entre les Allemands et nous-mêmes autant du moins que nous pouvons la gagner. Si McKenna et Churchill nous ont assuré une position très forte sur les mers, Haldane a forgé l'arme qui devait nous rendre de si grands services sur terre. La machine militaire britannique, comme nous la connaissons (et comme les Allemands la connaissent), notre merveilleuse armée territoriale, le cc training corps » de nos officiers (qui nous a été si utile), la transformation du corps expéditionnaire en une réalité pratique, tout est sorti de l'esprit clairvoyant et pénétrant de lord Haldane. Lorsqu'on se rappelle le long plaidoyer qu'il fit en faveur des territoriaux, les insultes auxquelles il fut en butte, ainsi que son projet, les cris ironiques qui accueillirent son affirmation que ces territoriaux, après la déclaration de la guerre, auraient le temps de devenir de bons soldats avant d'entrer en campagne, puis lorsqu'on voit à quel point ses prévisions se sont réalisées, l'on ne sait plus ce dont il faut le plus s'étonner, ou de la pénétration de son esprit, ou de l'ingratitude et de l'obstination méchante de tant de ses compatriotes. A mon avis, les générations futures regarderont lord Haldane comme l'un des sauveurs de notre pays. Nous avons été aussi extrêmement heureux, après le début des hostilités, dans le choix de nos leaders. Si l'on feuilletait les pages glorieuses de notre histoire anglaise, l'on ne trouverait pas d'homme plus propre, et par la nature et par l'éducation, à diriger l'organisation militaire, pendant une telle guerre, que lord Kitchener. Son esprit froid et mathématique, son don de prévoir l'année qui viendra après l'année en tours, la force de sa volonté inébranlable et inflexible, sa vie passée à l'écart de toute politique, toutes ces qualités font de lui un leader idéal dans cette lutte. Et quel collaborateur il possède dans Lloyd George qui vient apporter justement ce qui manque au soldat, la sympathie pour la démocratie, le don du verbe éloquent, et cette connaissance des conditions pratiques de la vie anglaise : Avec de tels hommes à l'intérieur, et avec des chefs comme ceux que nous avons sur terre et sur mer, depuis Jellicoe et French jusqu'à leurs subordonnés, nous pouvons sûrement envisager l'avenir avec un coeur léger. Nous n'étions pas les auteurs de cette crise, mais elle est venue du fait que les préparatifs secrets des puissances du centre de l'Europe les ont rendues pendant quelque temps plus formidables sur terre que leurs voisines. Nous avons dû suppléer aux troupes qui manquaient pour rétablir l'équilibre. Et grâce à un miracle d'organisation et d'esprit national, nous pourrons le faire. Ce qu'il y a de plus funeste dans les critiques déraisonnables de nos pessimistes, c'est qu'elles sapent l'énergie de nos hommes qui sont conscients du bon ouvrage qu'ils font, et leur donnent l'impression que le bien et le mal sont exactement semblables. De plus, elles découragent le public, et le portent à penser vaguement que tout va mal, lorsque tout, ou presque tout, va bien. Nos épilogueurs n'ont point heureusement critiqué la façon dont notre marine était dirigée et commandée ; mais prenons, par exemple, cette phrase qui revient sans cesse sur les lèvres, « le gâchis du ministère de la guerre ». Au contraire, l'une des surprises de la guerre a été l'admirable organisation des bureaux du ministère de la guerre. Y eut-il quelque gâchis, lorsqu'on envoya le corps expéditionnaire en France, avec une telle promptitude et si bien pourvu de tout, avec une intendance de l'aveu de tous incomparable, et un train des équipages et une organisation du service médical qui font l'envie de nos Alliés. Nous nous vantons d'avoir vu décupler notre armée, mais lord Kitchener n'arrive pas à de tels résultats d'un coup de sa baguette magique. Ils ont été obtenus grâce au travail énergique et à la puissance d'organisation des bureaux du ministère de la guerre, dont les occupations se sont multipliées en moins d'une année. Quant au sujet des munitions, c'est là une question qui nous a surpris, comme elle a surpris tout le monde, mais il est notoire que ce sont des raisons économiques, et non administratives, qui ont causé ce retard au sujet des explosifs puissants. Le libre-échange a sans aucun doute beaucoup d'avantages, mais il a aussi des désavantages en retour; et si vous dépendez d'autres nations pour avoir certains articles essentiels, au lieu d'arranger d'avance leur production dans votre propre pays, il est probable que vous aurez une crise semblable à celle que nous venons de franchir heureusement. A qui veut écrire l'histoire au jour le jour, aujourd'hui semble souvent désastreux. Mais ce n'est pas ainsi que l'histoire s'écrit. Nous voyons tous les tourbillons et les remous, mais l'avenir ne verra que le courant principal du fleuve. Nous n'avons aucune raison d'être pessimistes, mais nous avons plutôt d'excellentes raisons de nous agenouiller, pour remercier la Providence, qui guide notre destinée, et nous permet de donner des preuves évidentes que la Grande-Bretagne a encore, comme autrefois, la force intellectuelle d'organiser et la force physique de frapper.